Is it because people don’t like Steve Ballmer or because they love Bill Gates so much, that the rumor about Gates coming back at the CEO chair in Microsoft resurfaces with a surprising persistence? We don’t know, but what we do know is that Gates is not coming back. Ever. This time, the former Microsoft chief executive confirmed this himself in an interview for Australian Sydney Herald finally putting all rumors to dust. Bill Gates said he was committed to the Bill & Melinda Gates Foundation and that’s what he wants to do for the rest of his life. As to Microsoft, Gates confirmed he’s still active, but it’s “part-time Microsoft, full-time charity” and that’s how it’s going to stay. Gates also spoke about his sometimes edgy relationship with Steve Jobs, or rather the tough words Jobs would often address at Microsoft. Gates admitted Jobs was "brilliant," but also shared his opinions that it was the fact that Microsoft machines outsold Macs by a lot that irritated and could have caused the comments. The later Jobs was much kinder, Gates noted. Well, Jobs seems to have always been honest with his opinion on Gates. And even in the recently released biography by Walter Isaacson he iterated: "Bill is basically unimaginative and has never invented anything, which is why I think he's more comfortable now in philanthropy than technology. He just shamelessly ripped off other people's ideas." Gates’ in return had replied: "Don't you understand that Steve doesn't know anything about technology? He's just a super salesman." Now, this kind of debate is something we’d actually miss a bit, but in either case we finally have some clarity about Gates’ return. We’re curious to hear what you think about the current Microsoft leadership - should somethink change there? Drop your two cents in the comments below and for the video interview with Gates hit the source link. Gates is obviously a good guy, steve jobs is a cut throat business man - hence the lack of charity he donated to. Both cannot be really knocked, both contributed to tech greatly - without them we wouldnt have what we have. Tim cook did recently charity (1+1 action remember). Steve Jobs didn't. "Don't you understand that Steve doesn't know anything about technology? He's just a super salesman." very true. why are you being so stupid ? i dint say that but bill gates did. and yeah thats true. http://www.youtube.com/watch?v=_5Z7eal4uXI Part 1 both together. I didn't remember him saying that if he did then it was a joke. I think the core differences in their personalities is exactly what has played out in there lives. Gates is fine with having a platform that is more open ended, and customizable to the needs of anyone (Windows). And his personality is to take care of people and care for them, hence his philanthropy. Jobs was a visionary, yes, but he was extremely controlling of his products and how HE thought they SHOULD be. Even in his professional and personal relationships, he always approached them with a mind to being very protective, some might say controlling even. The results and how they chose to live their lives are self evident I would say. Even before death, Jobs specifically chose his autobiographer, so, "he would get it right." Gonna get some hate for this. Bill Gates won because he's alive. 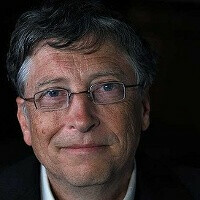 Bill Gates is the better of the two as far as people is being concerned, but remember, Gates crushed many lives to get as rich and powerful as he has to be charitable now. Jobs stayed that way until the end. Who knows if Jobs was in better health if he would have done something like Jobs when he grew tired of the endless wealth. We'll never know if he would have had a change of heart. However, Gates has repented and still does to this day. Even if he was a cruel man previously, he'll die an honorable one. Jobs didn't have this luxury, he died cruel. This rings so well... Even in Steve's final days, his rivalry with Android and Schmidt seemed consuming. It's unfortunate. He was brilliant in many respects, but he also let a number of chips in his shoulder rule his life. The sad part is many of those developed early on. You don't have to look much farther than his upbringing to see where it began.